When you think about redesigning your kitchen, colour schemes and furniture might be the first things you consider, however without a well thought out lighting plan, your design will not be complete. Lighting, although often overlooked, is a huge part of the aesthetics of your home. Knowing how to use lighting to maximise the beauty of your home is the first step to successful interior design. This post, written by lighting specialist KES Lighting, will show you how to incorporate the latest lighting trends into the most important room in your home. Our kitchens are the central hub for our families, the focal point of our homes and a place where a well thought out lighting plan is essential. 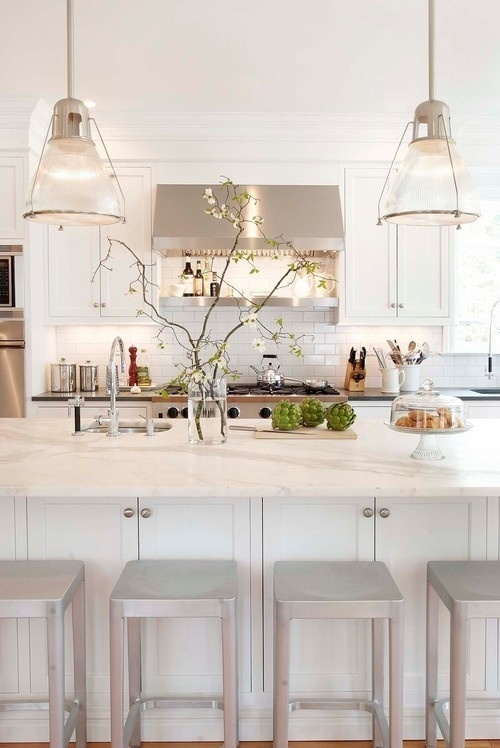 Your kitchen should consist of general lighting as well as task lighting, where certain lights are aimed at essential areas such as the family table and food preparation areas. The main light source of your kitchen should come from a combination of central lighting and recessed lights. A chandelier style fixture or long fluorescent ceiling lights should be used to light up the main area of your kitchen. The recessed lighting, commonly spotlights, should be placed around the perimeters of the room, around 2.5ft from the edge of the wall to add extra light where necessary. The kitchen table truly is the heart of the home, it’s where we eat our meals, talk about our day, complete homework with the children, sit down to coffee with friends, it provides an endless multitude of uses and therefore is the focal point to your kitchen. This is where you can add your creative flair to your lighting options. You need to take into account the size and shape of your dining area, if you have a large rectangular table; bar pendant style lighting could be the perfect solution. This could consist of anything from 3 to 8 lights hanging from a bar in about any style imaginable. Another idea, that’s incredibly popular right now, is the very retro rise and fall lights. The inspiration from many of these lights was taken from 1990’s France where they would have been commonplace in cafés and bistros. The height of the rise and fall lights can be adjusted to match the mood and occasion. Much like the kitchen table, this is a part of the room which needs to be well lit, a place for the family to get together over brunch as well as a space to prepare food. Pendant lights combined with spotlights are a great option here, the pendant lights should be hung allowing a 5.5ft space from the bottom of the light shade to the floor so the view across the room will not be obstructed. Rail and track lighting are a popular option when it comes to lighting up the sink area. Available in lots of different designs from straight tracks to curved, S-shaped rails you can adapt the lights to suit the area. If your sink faces a window you can maximise on natural light, if it doesn’t then you’ll need to play around with the direction of the lights until it works for you. A type of task lighting you may want to consider is under cabinet lighting, this can be made up of small spotlights, mini track lighting or modest fluorescent tubes. The lights should be placed at the front of your cabinet, not against the wall, to best illuminate your worktop. It’s worth considering dimmers for these lights so you can control light levels dependent on whether you’re preparing food or wanting to create a party mood. Getting the lighting right in your home can sometimes be tricky and a degree of research is needed, but get it right and your kitchen will be both beautiful and functional.